Democrats push plan to increase Social Security Benefits and Solvency. WASHINGTON — After years of Republican-led debate over how to pare back Social Security's rising costs, Democrats are flipping the script with an ambitious plan to expand the New Deal-era social insurance program while making gradual changes to keep it solvent for the rest of the century. The Social Security 2100 Act, which was introduced this past week in the House and the Senate, represents a sea change after decades dominated by concern that aging baby boomers would bankrupt the government as they begin drawing benefits from Social Security and other entitlement programs. It would be the first major expansion of Social Security since 1972 and the most significant change in the program since 1983, when Congress stepped in to avert a financial crisis by raising taxes and the eligibility age for Social Security. The bill would cut federal income taxes on Social Security benefits for about 12 million middle-income people while raising taxes elsewhere. The payroll tax rate would rise to 14.8 percent over the next 24 years, from 12.4 percent, and the payroll tax would be imposed on earnings over $400,000 a year.The maximum amount of earnings subject to the Social Security payroll tax this year is $132,900. The proposal would, in effect, create a doughnut hole, where earnings from $132,900 to $400,000 would not be taxed. The measure embodies Democrats' vision of social insurance at a time when many people have no private pension and meager savings. "Our bill, supported by more than 200 members of the House, would enhance and expand the nation's most successful insurance program, which touches the lives of every American," said Representative John B. Larson, Democrat of Connecticut and the principal author of the legislation. Mr. Larson, the chairman of the Ways and Means Subcommittee on Social Security, said he would hold hearings and forums around the country on the legislation.Among the strongest supporters is Representative Richard E. Neal of Massachusetts, the chairman of the full committee, who called a hearing for this coming week on ways to improve retirement security for American workers. And Andrew G. Biggs, a Republican who was the principal deputy commissioner of Social Security under President George W. Bush, praised some features of Mr. Larson's bill. On the other hand, Mr. Biggs said: "The bill would give a lot of money to middle- and upper-income retirees who are already doing well. And it would significantly increase payroll taxes on workers. "About 63 million people received a total of $1 trillion in Social Security benefits last year, and the number of recipients is expected to surge to 80 million in 10 years. Social Security was meant to be part of a package providing income to retirees along with company pensions and personal savings. But, Representative David Cicilline, Democrat of Rhode Island, said, "The reality today for more and more Americans is that they've used up their savings, they've helped a child go to school, they've dealt with a family illness. And many companies have taken away pensions." By contrast, under Mr. Larson's bill, Social Security would be solvent — "able to pay all scheduled benefits in full on a timely basis" — for 75 years, and after that its financial condition would be improving, according to projections by Stephen C. Goss, the chief actuary of Social Security. Democrats, weary of political fights over the Affordable Care Act and divided over a "Medicare for all" single-payer health care plan, relished the opportunity to rally around Social Security. They channeled the spirit of Franklin D. Roosevelt, introducing their bill on the 137th anniversary of his birth, while standing in front of a life-size cardboard cutout of him. The House speaker, Nancy Pelosi, "supports Democrats' efforts to strengthen Social Security and bolster seniors' retirement security," said Henry Connelly, a spokesman for Ms. Pelosi. She strenuously and successfully opposed efforts by Mr. Bush to divert some payroll taxes into the private retirement accounts favored by many Republicans. Nancy J. Altman, the president of Social Security Works, an advocacy group, said: "Expanding Social Security, with no cuts, is wise policy and winning politics. People are worried about a retirement income crisis, and this is a solution. 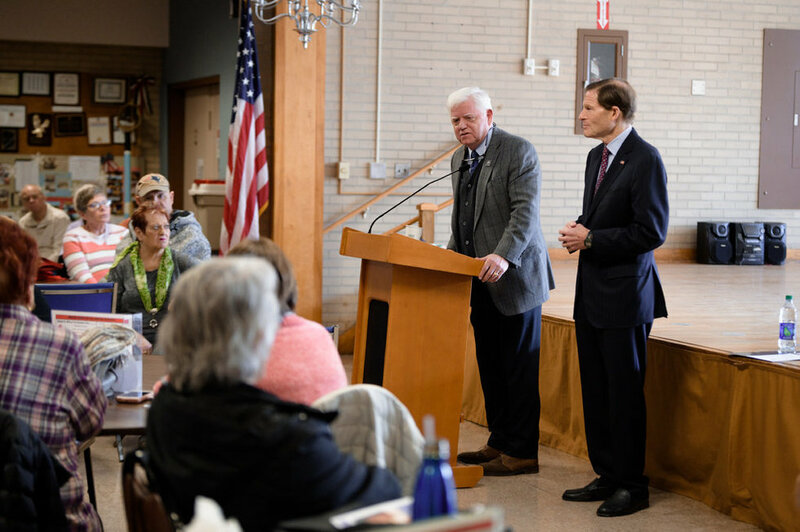 "Senators Richard Blumenthal of Connecticut and Chris Van Hollen of Maryland, both Democrats, are leading a push for the bill in the Senate. A strong vote for the bill in the House, combined with political pressure in a presidential election year, could create momentum for the bill in the Senate in 2020. In any event, it provides a template for future efforts to shore up Social Security. Republicans say that entitlement programs, not tax cuts, are the main reason for growing deficits. They have in recent years suggested unpopular changes in Social Security, including an increase in the retirement age and a new formula for computing cost-of-living adjustments that could reduce future benefits. As a presidential candidate, Mr. Trump said, "I'm not going to cut Social Security like every other Republican." Mr. Larson praised Mr. Trump for that stand and said, "It's no surprise that he carried the senior vote." As president, Mr. Trump has proposed cuts in projected spending on Social Security's disability benefits, on the assumption that more beneficiaries can return to work.The Congressional Budget Office injected a note of fiscal reality into the debates this past week. Assuming no change in existing law, it estimated that the budget deficit, $779 billion last year, would exceed $1 trillion every year from 2022 to 2029. It forecast remarkable growth in federal spending dedicated to people 65 or older. By 2029, it said, such spending, which includes Social Security, Medicare and Medicaid, will account for 50 percent of all federal spending aside from interest payments on federal debt. That represent a substantial increase from 35 percent in 2005 and 40 percent last year. Post Script. Though it has been only 2 years, it feels as though Trump and his repulsive fake presidency have dominated our national conversation for far too long. The Democratic victory in the House, the promise of the Mueller investigation, and the Congressional investigations which have begun have all created openings for Democrats to propose creative solutions to real problems we face. Proposal one- Looking at the pain of our extreme income inequality, Kamala Harris has proposed what she calls LIFT tax credits for Americans earning less than $100,000.00 per year which would positively impact an estimated one in every two workers and one in every three children in America - a true tax break for the middle class. And now this... a way to expand Social Security and give our people a safety net for a secure retirement at a time when pensions are disappearing.